Professor Juan Narro holds a Master’s degree in Administration from Universidad del Pacífico, Peru. He holds an undergraduate degree in Maritime Science from the Peruvian Naval Academy. He completed the Advanced Management Program (PADE) in Business Management at ESAN, Peru. Professor Narro holds a Diploma in National Security and Strategic Studies, from the United States Naval War College. He also completed the Colloquium on Participant Centered Learning (CPCL) at Harvard Business School, United States. Professor Narro has been the Head of the Office of Academic Quality, Continuous Improvement, Accreditation and Business Intelligence (OCAMECA), Head of the Office of Quality and Student Support (DARSA) and Director of Master’s degrees at CENTRUM Católica Graduate Business School. 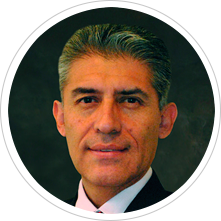 Professor Narro is a specialist in Electronic Engineering, Communications and Planning. He has been Head of the Communications Center at the Navy (Mollendo), Chief of Evaluation at the Naval Tactical Training Center, Head of Plans, Programs and Budget at the Peruvian Navy, Deputy Director at the Naval War College, Chief of Plans and Politics, and Commander-in-chief at the Joint Chiefs of Staff in Peru. He has been professor at Universidad del Pacífico, Naval War College and the National Center for Higher Studies (CAEN) in the areas of Statistics, Quantitative Methods, Strategic Planning and Management. Professor Narro currently is the Head of Efficiency and Continuous Improvement Department, Head of Thesis and Final Applied Assignment Office, and Professor at the Operations, Logistics, Supply Chain Management, and Technology Department at CENTRUM Católica Graduate Business School. Award for academic excellence in Master’s Programs, CENTRUM PUCP, 2012. Award for academic excellence in Master’s Programs, CENTRUM PUCP, 2013. Award for academic excellence in Master’s Programs, CENTRUM PUCP, 2014. Award for academic excellence in Master’s Programs, CENTRUM PUCP, 2015. Award for academic excellence in Master’s Programs, CENTRUM PUCP, 2016. Professor distinguished for academic excellence 2012-2017. Award for teaching excellence, CENTRUM PUCP, 2017. Award for teaching excellence, CENTRUM PUCP, 2018.